I'm starting a new blog. This is a taste of what I'm posting. That drawings reminds me of those 1930s Harman-Ising Happy Harmonies. Yeah, same period. Kind of like how everybody kind of draws alike now. 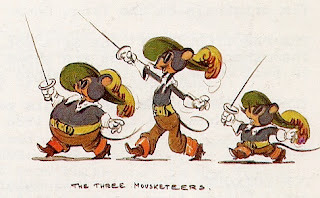 Also this guy was a main designer for Disney and Disney influenced everybody. but maybe stick a pic of your kids here? maybe a cartoon otf them at least? I'd like to see them? jorge...you are such a kidder , n'est-ce pas? lquidstarzzz, Who are you? How do you know I threw money out of windows?